I read my book through on Monday. I meant to take my time but I simply consumed it in three hours. I also meant to read it and just enjoy it the first time, but instead I had a pen in my hand and scribbled quick notes in the margins everywhere. Now I'm not sure what to do next. I have never faced an entire first draft of a novel before. In the past I would always revise the earlier chapters multiple times before going on. I am trying to decide whether to mark up the whole book and then revise, or to mark up one chapter, revise it, and then mark up the next chapter. Good-bye blog! CUL! I'm off on a research trip! Yes, close on the heels of my first writer's conference and my first meeting with an editor, I am taking my first official research trip! 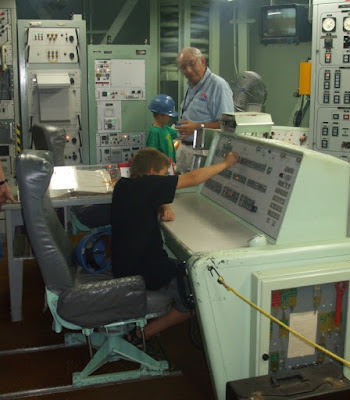 We are going to the Titan Missile Museum in Tucson, Arizona for a special tour on Saturday morning. I'm feeling a little sorry for the tour guide already. He'd better know his stuff because I've got A LOT of questions. 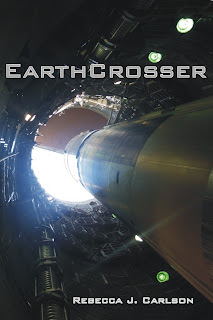 A lot of the action in my book takes place inside the control center of a missile silo based on the Titan II design. I've already written most of the scenes using my internet and library research, but an actual visit will allow me to put on the finishing touches that will breathe life into the prose. And help me get the choreography straight. And also give me some really great ideas I would never think of just sitting at my desk with a book in my lap. I AM SO EXCITED! When I cleaned out my pockets this evening I found a tape measure I'd taken from my nine year old when he was trying to measure the blades of his ceiling fan from his top bunk bed after lights out, and a pocketknife belonging to my eleven-year-old that would have gone through the wash for the third time if his pants hadn't made a loud clunk when I dropped them into the bottom of the washing machine. When I was in high school I wouldn't be caught dead in bell bottoms, unless it was, like, 70's day and we were supposed to look freaky weird. They must have been back in style for a while because I found a pair on clearance at Wal-Mart. Granted I didn't know what they were until I got them home and tried them on. Oh well, I thought, those tacky things go right into the charity box. But instead I hung them up in my closet and one day when the laundry was overdue I had nothing else to wear. I put them on and hoped no one would notice. They were surprisingly comfortable in the Las Vegas heat. I got some nice air circulation around my calves, almost like wearing capri pants. Now I wear them now and then, so long as I'm not going anywhere that I care very much what people think of me. And let me tell you what was really freaky weird. I went to a musical revue a few months ago and they had an 80's segment. Staring at those costumes, I realized- I used to wear stuff like that! My friends used to wear stuff like that! I've still got my cowgirl skirt in my closet, even though it is too small for me now - like my daughter is going to want to be caught dead in it!